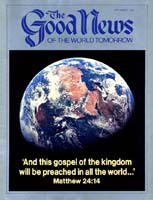 Jesus Christ came to earth more than 1,900 years ago to announce the good news of the coming Kingdom of God. That Kingdom will rule over all nations, and the supreme ruler will be Christ Himself. But Christ will not rule all by Himself, while spirit-born saints take an eternal vacation. The Bible shows they will rule with Him. Spirit-begotten Christians are now preparing for exciting responsibilities in the coming government of God! In this study we will discover what they will be doing in the world tomorrow. We'll learn how Christ and the saints will establish and maintain world peace after Christ's return. Then we'll see what utopian conditions will result from their righteous rule. 1. Where did Jesus Christ go after His resurrection? Acts 1:11, Revelation 12:5. Will He return to earth? John 14:3, Acts 1:11.
rule of the government of God over all the earth. God's government ceased to be administered on earth when the archangel Lucifer (now Satan), whom God had made ruler over this planet, led a rebellion of one third of the angels. Satan attempted to dethrone and replace God as ruler of the entire universe (Isaiah 14:l2-14)! The only place on earth where God's government is administered today is in God's one true Church. However, when Christ returns, many rulers of nations will refuse to yield to Christ's authority and will actually try to fight Him. Christ will therefore be forced to subdue these nations with His great power. 3. Will Christ be the supreme ruler in the coming government of God on earth? Revelation 19:16. Where will He establish His throne? Jeremiah 3:17. In the coming Kingdom of God, government will be from the top down, with Christ supreme. From His headquarters in Jerusalem, Christ's rule will spread over the entire earth. 4. Will the spirit-born members of God's Family — those Spirit-begotten Christians who faithfully obeyed God and proved their loyalty to Him during their mortal lives — assist Christ by reigning with Him in the world tomorrow? Revelation 2:26-27, 3:21, 5:10, 20:4. What did God inspire Daniel to prophesy? Daniel 7:13-14, 18,22,27. Will many be mayors over cities? Luke 19:16-19. 5. In addition to being rulers, will the children of God also be priests? Revelation 5:10, 20:6. What is the function of a priest? Malachi 2:7. Just as ancient Israel's priests taught God's way, spirit-born members of God's Family will also teach God's way of life, helping to bring the knowledge of the way of salvation to everyone in the world tomorrow. 6. As the nations begin to see the positive results of the righteous and loving rule of God's government, will they seek Christ and ask for instruction in God's way of life? Micah 4:1-2. Will people learn the way to peaceful productivity? Verse 3. In addition to being ,the supreme King over all nations, Christ will also be the supreme Educator. To bring mankind to repentance, Christ and His assistants will reeducate the world to God's way of life — the way of God's law of love — so people may, of their own free will, decide to follow His way. Reeducating humanity to God's way of life will receive top priority. Under Jesus Christ, the Kingdom of God will restore the laws and rule of God to the entire earth. 7. How successful will the spirit-born saints be in teaching God's way to the world? Jeremiah 31:34, Isaiah 11:9. As a result, will the world tomorrow become like one great feast of rejoicing? Isaiah 25:6-7. No religious confusion will exist during the Millennium because Satan will have been completely restrained at Christ's coming (Revelation 20:1-3). The devil will no longer be the "god of this age" (II Corinthians 4:4),who deceives the world, influencing all humanity to sin (Ephesians 2:2, Revelation 12:9). Once the spiritual blindness that Satan has cast upon mankind is removed, humans will become teachable — their eyes will be opened to God's revealed truth. As the world becomes reeducated, people will begin to experience the blessings that come from obeying God's law of love. There will be peace, cooperation, good health, prosperity and joy. This peaceful, happy millennial world is pictured by the Feast of Tabernacles, observed every year by the Worldwide Church of God. Let's take a brief look at the utopian conditions that will exist in the world tomorrow. 8. What will the cities of God's world be like? Amos 9:14, Zechariah 1:1 7, Isaiah 60:18. Will these cities of the world tomorrow be filled with happiness and joy? Jeremiah 33:10-11, Zechariah 8:4-5. After Jesus Christ returns, today's cities, many of which will have been destroyed by nuclear warfare, will be rebuilt according to God's standards (Ezekiel 36:33-35, Isaiah 61:4). Gone will be the vast, pollution-laden, overpopulated metropolises filled with every kind of evil that we are so familiar with today. Tomorrow's cities will be peaceful and beautiful, promoting healthy, happy family life. 9. Will the old waste places be made fertile, and will beautiful forests spread in the Millennium? Isaiah 41:18-20, 35:1-2, 6-7. Most of the earth's land surface will become productive during the coming millennial age. Beautiful forests, agricultural areas and fish filled lakes and streams will be found all over the world, with no more polluted rivers or ravaged landscapes. 10. Confusion of languages is one of the major barriers to cooperation between peoples. Can you imagine what a world of one language would be like? Think what a huge step forward it would be if people everywhere could speak, read and write the same language. Will God indeed give the world one language so all can serve Him with one accord? Zephaniah 3:9. In the world tomorrow, Christ will usher in an era of worldwide literacy and education through one pure language. 11. Will people own property in the Millennium and reap the just rewards of their own labor? Micah 4:4, Isaiah 62:8-9. 12. Upon what condition has God always promised to bless people materially? Malachi 3:10-12. Will God cause the laws of nature to function for the benefit of the obedient in the world tomorrow? Ezekiel 34:26. Will there be great rejoicing over the abundance of crops and livestock God will bestow? Jeremiah 31:12. Will there actually be a superabundance of food? Amos 9:13. As people learn to obey God, He will bless them for their obedience, causing ideal weather conditions. No longer will farmers worry about upset weather, droughts, floods, insect damage or agricultural diseases. 13. What about health in tomorrow's world? Will the blind, deaf, lame and dumb be miraculously healed? Isaiah 35:5-6. Will all types of sickness and disease be healed? Isaiah 33:24, 58:8, Jeremiah 30:17. In the world tomorrow, the miraculous healing of all diseases and the teaching and practice of God's laws of health will result in vibrant health for everyone. 14. Will God cause the natures of wild animals and poisonous creatures to become peaceful and harmless in the Millennium? Isaiah 11:6-8. 15. In the Bible, God speaks of man's heart as symbolic of man's mind. What is man's mind like today, as influenced by the god of this world? Jeremiah 17:9. Is man's mind naturally submissive to God and His law? Romans 8:7. 16. What does God say He will add to the minds of people in the Millennium to change their basic attitude or nature? Ezekiel 36:26-27, Joel 2:28-29. What characteristics of God's nature will God's Spirit impart to people? Romans 5:5, Galatians 5:22-23. God has promised to place His Spirit within repentant mankind during the Millennium. People will then express outgoing love and concern for fellowman, and will obey God. God's Holy Spirit is the key ingredient that will make the wonderful world tomorrow, God's Kingdom, the utopian paradise pictured by the joyous Feast of Tabernacles! In this brief study we've seen only a glimpse of what the exciting world tomorrow will be like. To learn more, click this link for a copy of our free book The Wonderful World Tomorrow - What It Will Be Like?.